As you know, we love to be outside enjoying everything mother nature has to offer. Whether it be camping, hiking, backpacking, bicycling, running... well you get the point. The one thing that makes these ventures possible and of course more enjoyable, is the gear we use while on our journeys. 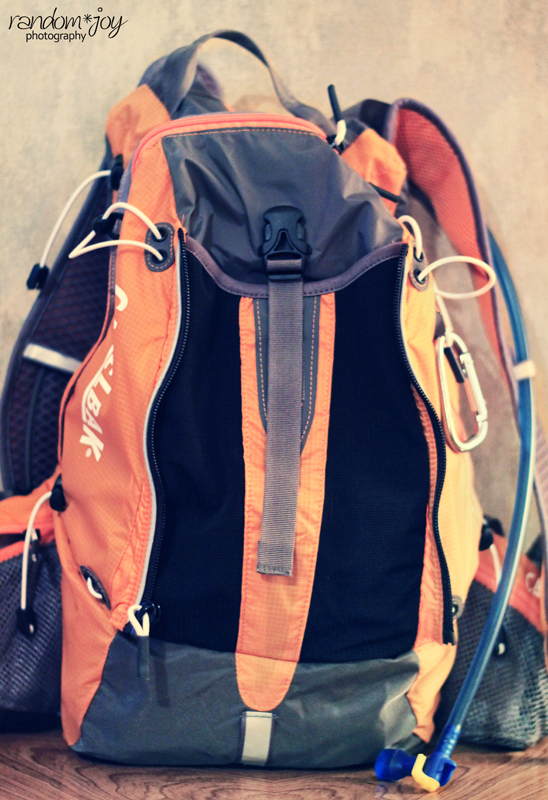 From day packs to backpacks, from running shoes to hiking boots, and everything in between, yes even telescopes. The gear we use will be reviewed on the blog and links to the reviews will be provided here so you can find them easier as they get buried among other posts. We hope you find our reviews useful and insightful. Let us know what you think and of course if you have any questions, please don't hesitate to leave a comment or drop us a line at appalachiaandbeyond (at) gmail (dot) com. 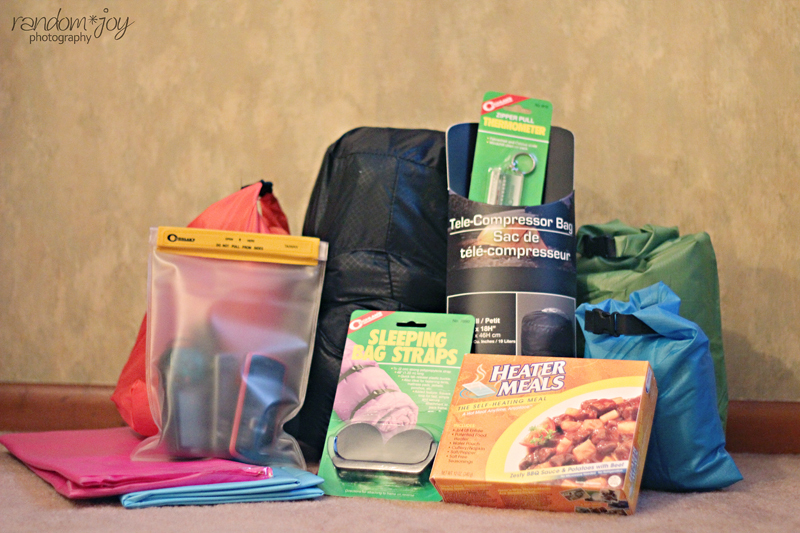 Additionally, we are always open to doing gear reviews, but we prefer to do reviews of outdoor related gear or food that can be used on the trail backpacking or hiking. 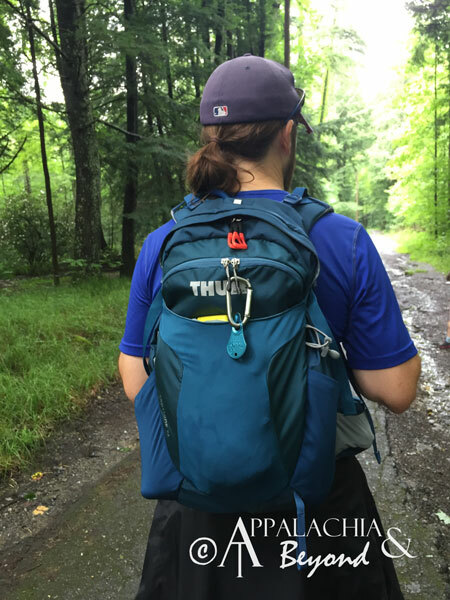 If you are a manufacturer of outdoor related gear or food, or a retailer of outdoor products and would like for Appalachia & Beyond to review your products, please contact us at appalachiaandbeyond (at) gmail (dot) com to discuss possible review opportunities. 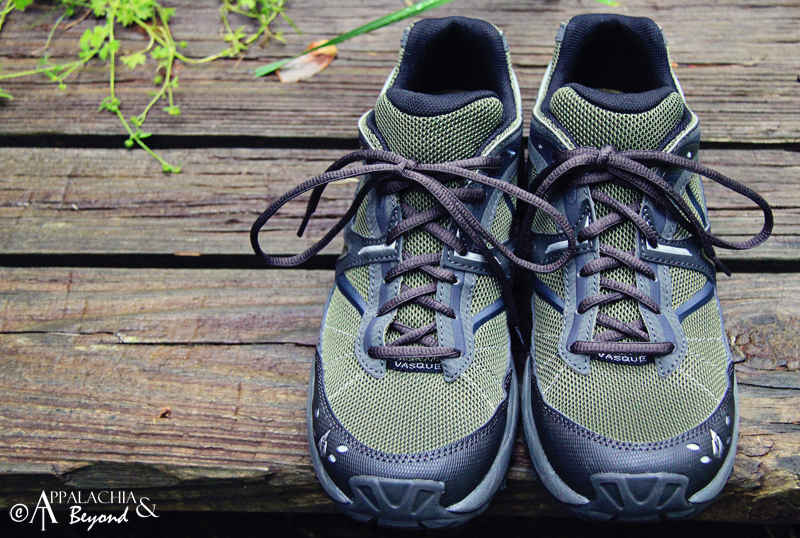 Vasque Mindbender 7516 - Tim reviews a pair of Vasque Mindbenders he received from Vasque Footwear as a consolation prize for trying so hard in a contest/giveaway they had on their Facebook wall. Vasque Taku GTX - Robin reviews the Vasque Taku GTX hiking boots she recieved from one of the Outdoor Blogger Network's gear review opportunities. 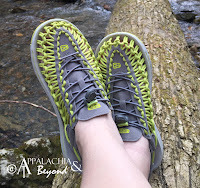 Keen UNEEKs - Robin reviews the Keen UNEEKs open air footwear she received from Keen. Robin received the sandals for review purposes only. SportScience Smarter Shirts - Tim and Robin both review the Smarter shirts by SportScience. Robin received the Long Sleeve V-Neck and Tim received the crew neck short sleeve tee for review purposes. Terramar Helix Mountain Tee Body-Sensors Crew T-shirts - Tim reviews the Helix Mountain Tee Body-Sensors t-shirts by Terramar. Tim received the shirts for review purposes as a member of the Terramar Tribe brand ambassador program. 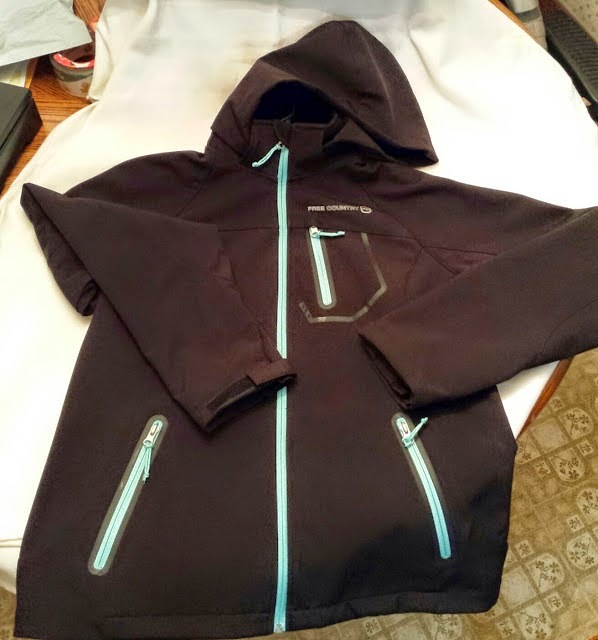 Terramar Body-Sensors Thermolator II Jersey - Tim reviews the Thermolator II by Terramar. Tim received the shirt for review purposes as a member of the Terramar Tribe brand ambassador program. 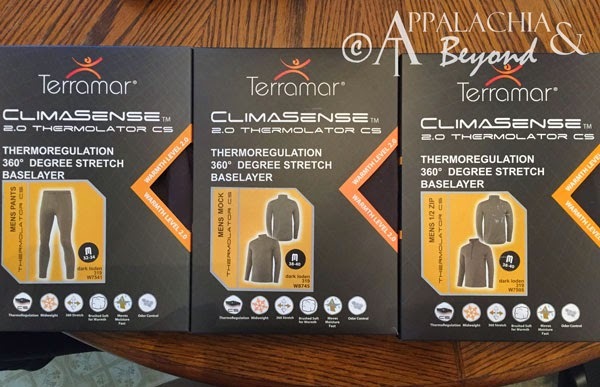 Terramar Climasense 2.0 Thermolator (Pants, Mock, and 1/2 zip) - Tim reviews the Climasense 2.0 Thermolator series by Terramar. Tim received the pants, mock, and 1/2 zip for review purposes as a member of the Terramar Tribe brand ambassador program. Goodhew Medium Hiker Socks - Robin will be reviewing Goodhew's Medium Hiker socks that she received in the same gear review opportunity that she received the Vasque Taku GTX boots in from the Outdoor Blogger Network. Free Country Women's Spectral Softshell Jacket - Robin reviews Free Country's Women's Spectral Soft Shell Jacket that she received for review purposes only. 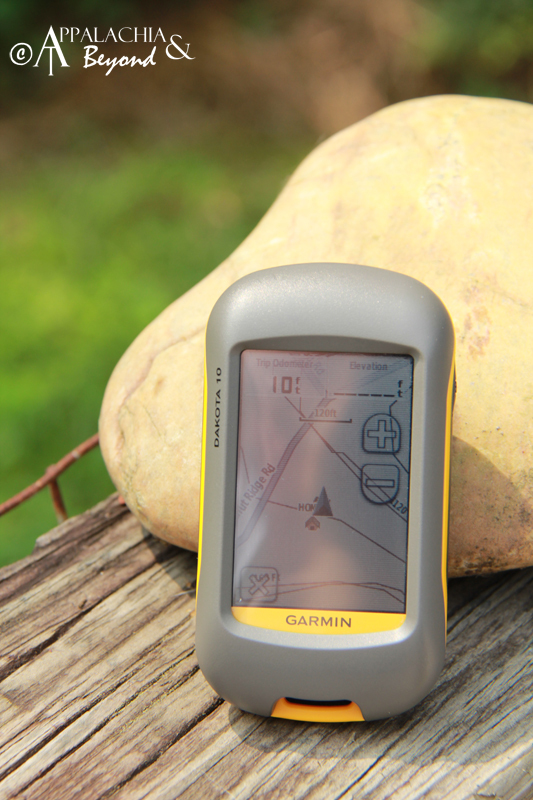 Garmin Dakota 10 GPS - Tim reviews the Garmin Dakota 10 GPS that he received from Take A Hike GPS for review purposes. Garmin Montana 600 GPS - Tim reviews a brick the Garmin Montana 600 GPS that he received from Take A Hike GPS for review Purposes. COAST Rapid Response 3.00 - Tim reviews the Rapid Response 3.00 knife that he received from COAST Products for review purposes. 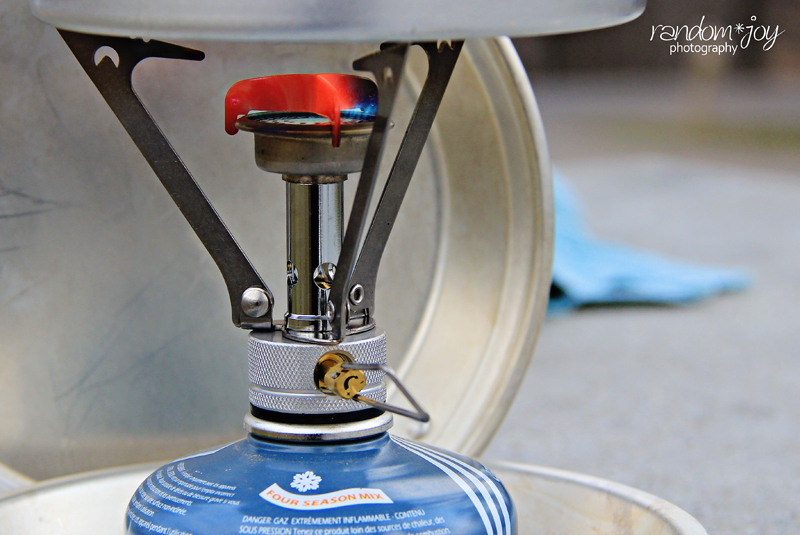 MSR Pocket Rocket - Tim and Robin review their MSR Pocket Rocket backpacking stove they bought for Christmas. ENO Double Nest and Slap Straps - Tim and Robin review their ENO Double Nest Hammock and Slap Straps that Robin bought Tim for Christmas. Thule Capstone 32L - Tim reviews the Thule Capstone 32L Backpack that he received from Thule for review purposes. Camelbak Octane 18x - Tim reviews his Camelbak Octane 18x day/hydration pack he bought for himself. Camelbak Marathoner's Vest - Tim reviews the Camelbak Marathoner's Hydration Vest for Brian's Backpacking Blog. Brian sent the vest to Tim for review purposes. Osprey Poco Plus - Tim reviews the Osprey Poco Plus Kid Carrier Pack that he received from Osprey Packs for review purposes. Kupilka Cup - Tim reviews the Kupilka Cup that he received from Sport Hansa for review purposes. 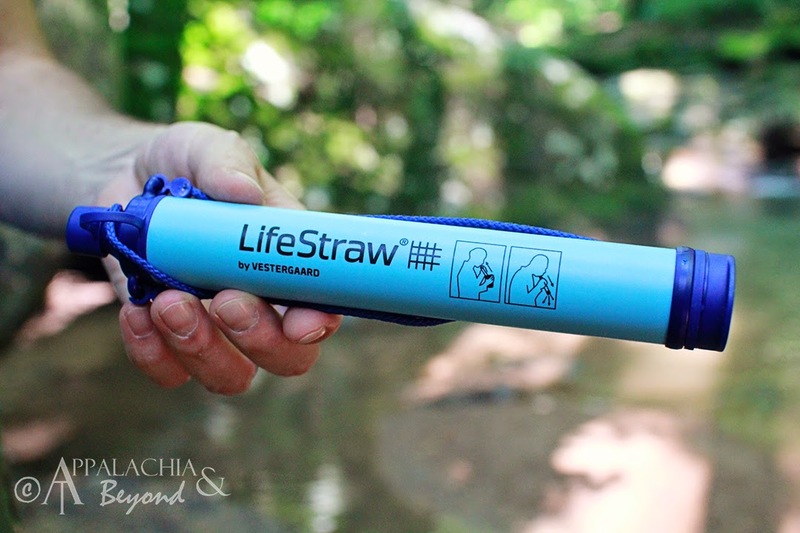 LifeStraw - Tim and Robin review the LifeStraw from Vestergaard for review purposes. 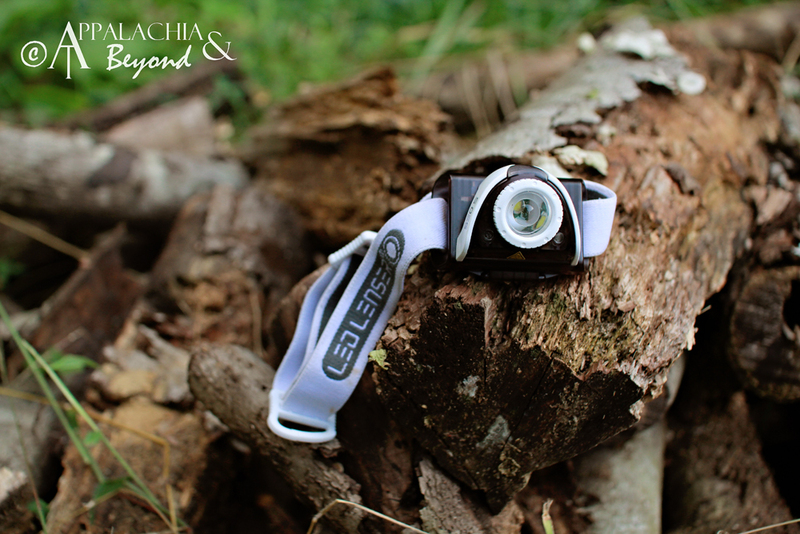 LED Lenser SEO 5- Tim reviews the LED Lense SEO 5 Headlamp from LED Lenser for review purposes. Dorcy L.E.D. Headlamp - Tim reviews the Dorcy L.E.D. Headlamp from Dorcy International for review purposes. 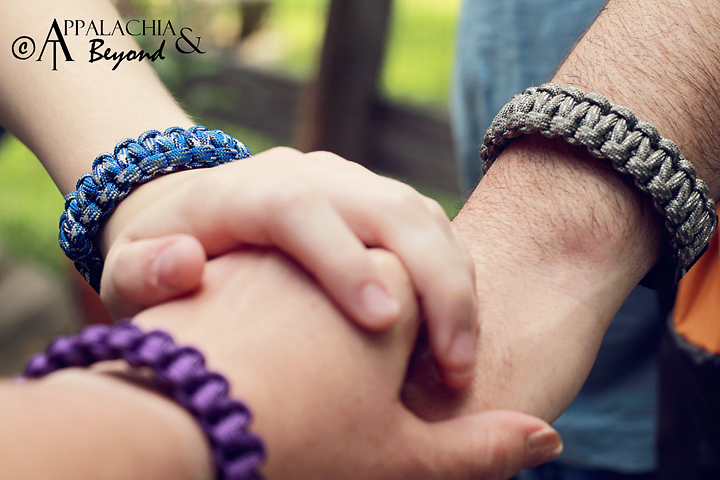 Cobrabraid 550 Paracord Survival Bracelet - Tim and Robin review the large and small 550 paracord survival bracelets and keychains they received from Cobrabraid for review purposes. GoGirl - Robin reviews the one item you'd never think of that you can't live without - provided you're female. 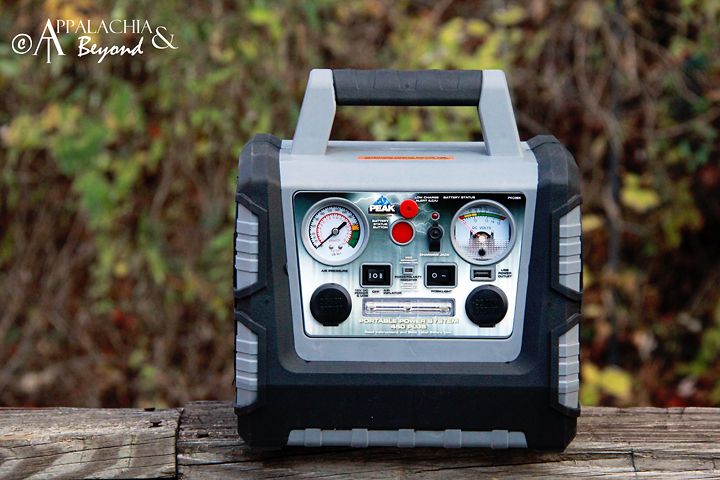 Peak Portable Power Station 450 Plus - Tim and Robin review the Peak Portable Power Station 450 Plus. The power station was sent to Tim and Robin by Peak Performance for review purposes. Space Bag® Dual-Use Bags - Tim and Robin review the medium and large Space Bag® Dual-Use bags. These were sent to us by Space Bag® for review purposes. An excellent, cheap alternative to pricey compression stuff sacks. 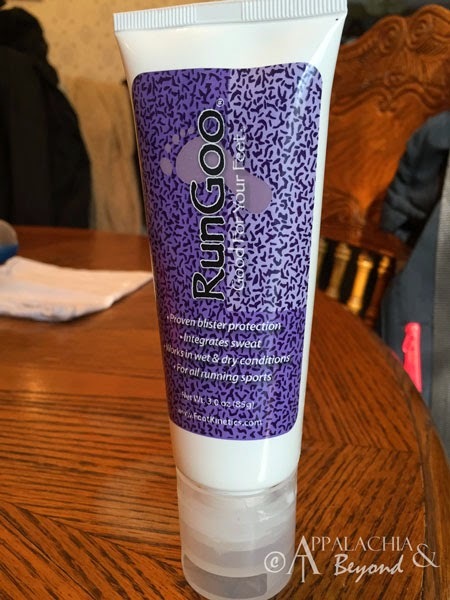 Run Goo - Tim reviews Run Goo by Foot Kinetics. 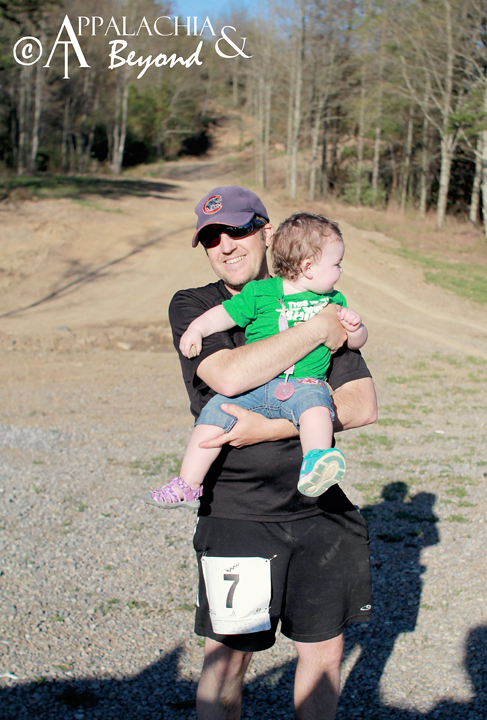 Foot Kinetics provide a tube of Run Goo to Tim for review purposes. The ultimate in blister prevention. Body Glide - Tim reviews Body Glide: Anti Chafe Original Balm by Body Glide. Body Glide provided a Body Glide Anti Chafe Original Balm to Tim for review purposes. The best in blister and chafing prevention. 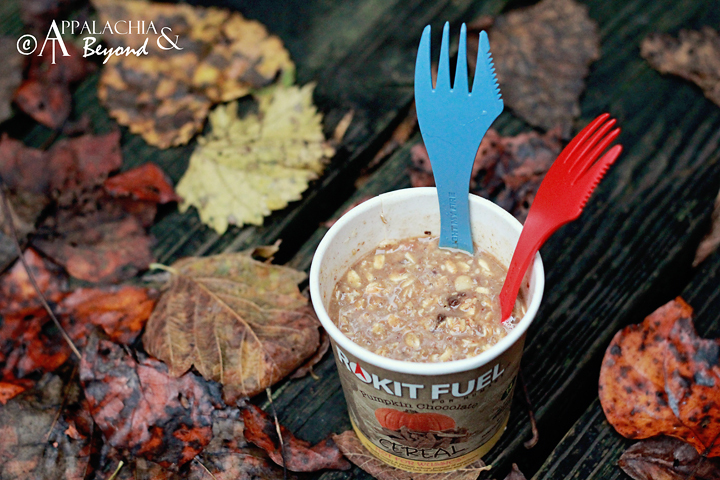 Rokit Fuel Oatmeal - Tim and Robin review Rokit Fuel Oatmeal. These were supplied by Rokit Fuel for review purposes. In this review, 4 flavors: Cherry Almond, Stud Muffin, Pumpkin Chocolate, and Chocolate Dream. Heater Meals - Tim and Robin review Heater Meals: Zesty BBQ Sauce & Potatoes with Beef they bought at Bass Pro Shops to try as a backpack meal alternative. Heater Meals Revisited - Tim and Robin review Heater Meals: Green Pepper Steak with Rice and Chicken Pasta Italiana. These were sent by Heater Meals' marketing department for review purposes only. They worked great in the field. 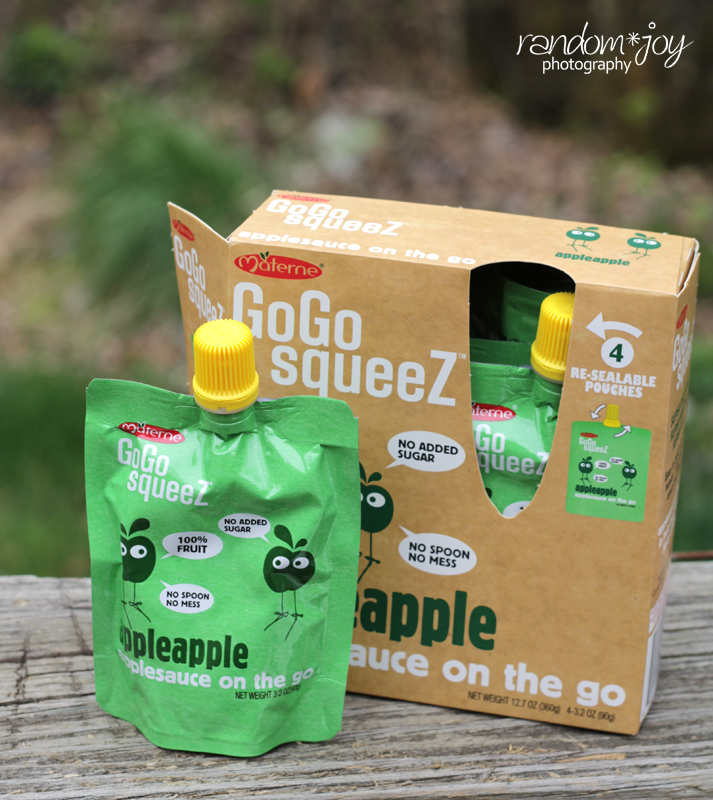 Munk Pack Squeezable Oatmeal - Tim reviews Munk Pack Squeezable Oatmeal that he received from Munk Pack for for review purposes. 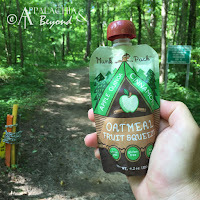 They make a great trail snack whether you are hiking, backpacking, or trail running. 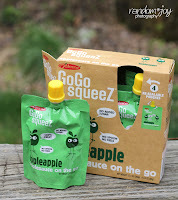 Gogo Squeeze Applesauce - Tim and Robin review Gogo Squeeze's Apple Apple Applesauce they bought at Walmart to try as a trail snack. Brother's All Natural Crisps - Tim, Robin, and Ms. Coo review Brother's All Natural Crisps: Pineapple and Cinnamon Apple they bought at Walmart to try as a trail snack. Duraflame®'s Campfire Roasting Logs™ - Tim and Robin review Duraflame®'s Campfire Roasting Logs™ that they received from Duraflame® for review purposes only.